Several world performances with the participation of the Yurlov Choir followed. Spring 2005 during “The Cherry-Tree Forest” festival the Yurlov Choir in collaboration with Yuri Bashmet executed Symphony No.4 for violin, choir and orchestra “Devoted to the 60th Great Victory Anniversary” and “Russian Requiem” by A.Tchaikovsky. 2006 A successful first performance of “Requiem” by Alemdar Karamanov in Moscow. 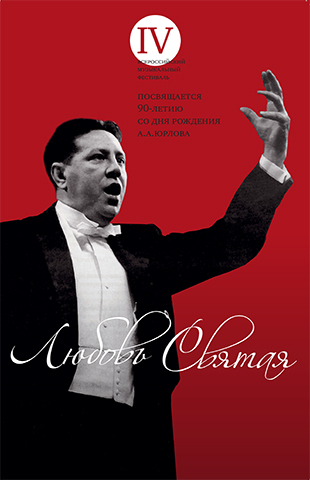 2007 Admirers of Georgy Sviridov experienced first performance of the composer’s “The Friendly Guest” cantata, executed by the Yurlov Choir at the Moscow International Music Centre. Next December the ensemble performed it in Kursk, which is composer’s homeland. 2008 Long-term collaboration with Shirvani Chalayev developed into premier of the new opera “Cossacks”. 2009 began with the musical premier of “Russian Christmas Carols” by Alexey Larin. Yuri Bashmet’s execution of “Styx” by Giya Kancheli for viola and choir at the anniversary concert of the composer became an outstanding event in Moscow music life. In collaboration with Yuri Bashmet the Yurlov Choir performed “The Myrrh-Bearer“ for viola, chorus and drum of the famous British composer John Tavener, first time in 2009. The Choir’s repertoire was enriched with such large-scale compositions as “Mass in C minor “ by W.A. Mozart, “Stabat Mater” by Gioachino Rossini, cantata “Gloria” by A. Vivaldi, “Lakme” by Loe Delib, cantata “Carmina Burana” by Carl Orff, “Cantico de la Pieta” by Anton Garcia Abril, “Itaipu” by Philip Glass. The Choir has and continues to foster relationship with other distinguished performing ensembles Rundfunk-Sinfonieorchester Berlin ensemle, The State Academic Symphony Orchestra of Russia (Svetlanov Symphony Orchestra), State Symphony Orchestra Novaya Rossiya, State Symphony Orchestra/Music Director & Chief Conductor Pavel Kogan, Moscow City Symphony Orchestra “Russian Philharmonic”, Russia State Symphony Orchestra of cinematography, Russia Symphony Orchestra, Musica Viva chamber orchestra and many others. In recent years we have collaborated with famous symphonic conductors, such as Yury Bashmet, Pavel Kogan, T.Kurentzis, S,Skripka, A.Nekrasov, A.Sladkovsky, M.Fedotov, E.Bushkov, S.Stadler, F.Shtrobel (Germany), R.Franz (Germany), A.Mustonen (Estonia), R.Kapasso (Italy), A.Vakulsky (the Netherlands), V.P. Perez (Spain), V.Kakhidze (Georgia), S.Smbatyan (Armenia), E.Topchan (Armenia). The Yurlov Choir has opened new areas of concert activity and joined in various music projects. First steps were taken to implement this project. The Choir toured through the Volga River Valley of Russia, gave concerts in Uglich and Ryazan. Kremlin Festival appearances also included Kursk, Orenburg, Saratov, Cherepovets, Vologda, Tver, Donetsk, Obninsk, Nizhniy Novgorod, Ulyanovsk, Izhevsk, Votkinsk, Ostashkov, Smolensk, Velikiy Novgorod and Nilo-Stelobensky Cloister at the lake Seliger within recent years. In recent years the Choir toured extensively abroad, to Yerevan (Armenia), Vilnyus (Litva) – Russian Orthodox Music Festival; Canary Islands – Christmas Festival; and North Korea. The Yurlov Choir, conducted by Gennady Dmitryak performed during well-known music festivals: Valery Gergiyev’s “Moscow Easter Festival”, “Cherry-Tree Forest”, “Autumn Choral Festival”, organized by the Moscow Conservatory, “In Memory of O. Kogan”, “Music Autumn in Tver”, “Irina Arkhipova’s Festival” in Ostashkovo, choral festivals in Vilnyus and Lipetsk. Traditions of the majestic Russian choir have made it an indispensable to 60th Anniversary of the Victory in the World War II celebrations. The Yurlov Choir was one of the key members of gala concerts at the Red Square during the May Holidays and at the Anniversary of the Victory Parade. In recent years many young and talented singers joined us. Yurlov Choir draws its singers from state and national universities’ finest choral alumni, and most are professional musicians or have degrees in vocal music and conducting. They are graduates of the Moscow State Conservatory, Gnessins Academy of Music, Academy of Choral Art, Saratov Conservatory, Ufa Academy of Arts, Krasnoyarsk Institute of Arts. One of the principles of work in the Yurlov Choir is generational continuity – highly qualified singers share their experience with young performers in the process. In autumn 2003 Yurlov Russian State Academic Choir moved to a new building. It is a roomy premises with a specious hall and good acoustics. During 2009, the anniversary year the Yurlov Choir programmed Russian Christian music including compositions of M. Berezovsky, S. Taneev, S. Rachmaninov, A. Grechaninov, P. Tchaikovsky; West European classical masterpieces including compositions of A. Vivaldi, G. Rossini, G.F. Handel, W.A. Mozart; and world famous excepts of opera music in collaboration with famous guest singers. Within “Russian Kremlins” festival the Yurlov Choir gave anniversary concerts with local guest singers in various cities. In may 2009 the Yurlov Russian State Academic Choir was awarded with the First Prize at the International Festival of Orthodox Church Music „Hajnówka 2009” (Poland), and prestigious award from the President of Poland Television. The Yurlov Choir went down in history of performing art with its characteristic features – special large-scale sound patterns, its own method of interpretation of world and congenial native classics. Today the Choir’s impressive repertoire is determined by its long history, intergenerational continuity (a number of Russian and foreign classical compositions form its “gold fund”); principles of work, keen interest in contemporary music, its wide expressive potential. The Yurlov Choir’s repertoire includes large cantata and oratorio compositions from the grand “Mass in h-moll” by J.S. Bach to “Sticks” by Gia Kanchelli; it is a gold mine of choral miniatures from Renaissance madrigals to genre musical pictures of Yu. Falik and N. Sidelnikov. One of the complex tasks that the Yurlov Choir solves today is natural fusion of traditionally strong and rich sounding timbre with plasticity and virtuosic liveliness of sounding. Stylistic and genre variety of choral compositions, that the Choir executes, makes demands. An important feature of the Choir that can’t be left out in the cold is that they aspire to make the most out of their professional and creative potential. The importance of this fact can scarcely be overestimated – audience feels that the Choir is completely devoted to work. Priceless gift of the Yurlov’s Choir is the inherited centuries-old traditions, fostered be a pleiad of best masters of choral art.